After President Donald Trump drove the U.S. into an all-out trade war with Canada on Saturday with his Twitter outburst threatening to hit America’s northern neighbor with even more punitive tariffs, Trump’s top trade adviser Peter Navarro placed blame for soaring tensions entirely on Canadian Prime Minister Justin Trudeau in an interview on Sunday and warned “there’s a special place in hell” for those who cross the president. 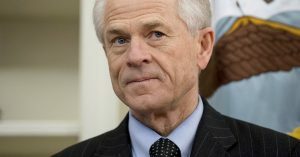 “There’s a special place in hell for any foreign leader that engages in bad-faith diplomacy with President Donald J. Trump and then tries to stab him in the back on the way out the door,” Navarro said in an interview on Fox News, referring to Trudeau’s decision to move ahead with retaliatory tariffs against the U.S. after Trump refused to back down from his recently announced steel and aluminum penalties. Navarro wasn’t the only top Trump adviser to use his appearance on a Sunday talk show to take pot-shots at Trudeau for daring to respond to the president’s tariffs. Kudlow went on to assert that Trump’s continued tariff threats against Canada on Saturday were a show of toughness ahead of the president’s meeting in Singapore with North Korean leader Kim Jong-un. Columbia University professor Jeffrey Sachs express similar disbelief at Kudlow’s behavior in a tweet on Sunday.